Former Philadelphia Eagles defensive end Steven Means sacks Dallas Cowboys quarterback Dak Prescott during the second quarter of last year's season finale at the Linc. After surviving the Jaguars in London two weeks ago, the Eagles emerge from the bye week at 4-4, sandwiched between Washington and Dallas — a game behind the former a game ahead of the latter — for second place in the NFC East. And with just half the season remaining, four of the Birds' final eight games will be against one of those two teams. In other words, if Doug Pederson's team hopes to be the division's first repeat champion since the Eagles won four straight from 2001-2004, they'd be wise to take care of business at home against Dak Prescott and Co. The Eagles schedule is really rough, yes, but the next five games set up rather nicely for Philly. After hosting the Cowboys Sunday night, the Eagles face a brutal battle in New Orleans against the new Super Bowl favorites before hosting the lowly Giants, facing Dallas in Dallas and hosting the beat down NFC East leading Redskins. Coming out of the bye week healthy and reloaded (with Golden Tate, who had an extra week of practice to acquaint himself with Philly's offense), I think the Birds are a good enough team to take four of those five to get to 8-5 before their final three games (two on the road) against current division leaders. In my completely unreliable opinion, this is the start of the push we've been waiting for. I expect the Eagles offense to be inspired and their defense to play confident after being rested Sunday night, and a convincing 31-20 victory will follow. Mailbag: Where will Sleevie Wonder (a.k.a. Sam Bradford) end up in 2019? The Eagles are seemingly getting the Cowboys at the right time, as Dallas is coming off a bad Monday night loss to the Titans, while the Birds are well-rested after their bye week. But that's not the only thing the Eagles have working in their favor in this one. Ooh, I got one too! And while the Eagles are banged up on defense, most of those injuries are in the secondary, meaning Fletcher Cox and the rest of the Birds' front seven, can help focus on stopping Ezekiel Elliott and the Cowboys, who are sixth in the NFL in total rush yards and fourth in yards per carry. Meanwhile, the Eagles defense ranks second in yards allowed, mainly because teams are too afraid to try to run against the Birds. 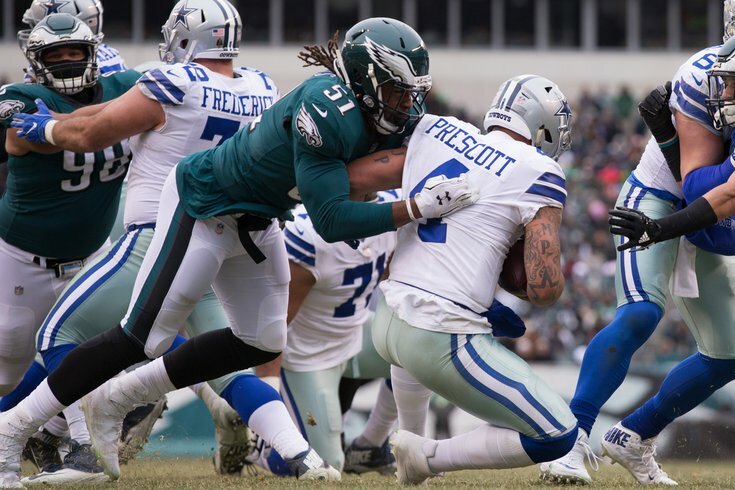 If the Eagles defense can shut down the Cowboys run, and force Dak to pass the ball more often, that will allow Jim Schwartz to dial up the blitzes and get some pressure on him. On the other side of the ball, you have a pass-happy offense going up against one of the top pass defenses across the board. The difference here is that the Eagles have one of the best quarterbacks in the league — and he's been playing much better than his Dallas counterpart. In other words, the Eagles are the better team in this one, and I think they come away with their second divisional win of the season on Sunday night. Oh, and the Birds are wearing their all-black uniforms. The Dallas Cowboys made the splashiest midseason wide receiver addition in the league with the Amari Cooper trade. I’m not sure it’s going to really matter unless they eventually find a new quarterback, because Dak Prescott has been consistently mediocre for damn near a season and a half. From an Eagles perspective, Prescott has also been mediocre in ways that suit Philadelphia’s defense the best. Their propensity to get burned for big-yardage plays will go up against his disinterest in throwing the ball downfield, and Sunday night will likely be a test of which of those trends wins out. The Eagles are banged up in the secondary and that’s where you’d expect the big battle to take place — they haven’t shut down Ezekiel Elliott in his two appearances vs. Philadelphia, but they have held him without a touchdown and under his career average on yards per attempt. Philadelphia’s offense needs to start putting more points on the board, but Carson Wentz is playing at a high level and has another weapon to turn to with Golden Tate in the mix. Are the Cowboys really going to shake their 0-4 away record at the Linc? I think not. The Eagles kill off Dallas’ season in primetime. Two factors help here: The Eagles are coming off a bye week, rested and heeled, while Dallas is coming off a short week — and the Cowboys are a desperate team. Golden Tate will help an offense that's still finding itself and the Eagles will clamp down on the one-dimensional Dallas offense. I see this is a pretty easy Eagles victory, in front of a crazed crowd before a national TV audience — while also ending the Cowboys' season, dropping them to 3-6. Caution: Let's see if the Eagles get this right, because every time something has looked this good this season, they've fallen flat on their faces. I'm counting on that pattern to be rectified Sunday night.